A luminometer measures the output from its associated sampling device/test pen and gives a reading which is proportional to ATP concentration and thus an index of fouling. ATP is a molecule found in and around living cells, and as such it gives a direct measure of biological concentration and health. ATP is quantified by measuring the light produced through its reaction with the naturally occurring firefly enzyme luciferase using a luminometer. The amount of light produced is directly proportional to the amount of living organisms present in the sample. ATP is an excellent indicator of microbial activity in industrial environments. ATP is the primary energy-transferring molecule in all living cells. Metabolic processes that produce energy in a cell use ATP to transfer the energy to other cell reactions which require energy. While alive, cells produce ATP continuously. When processes for ATP production are inhibited, all available ATP is consumed. Without ATP, bacteria become dormant, and, unable to maintain cell integrity, eventually die. When cells are killed, their ATP rapidly decreases. Thus, ATP can be used to monitor levels of metabolically active organisms in a liquid or deposit sample. Detects all bacteria - aerobic and anaerobic. No bias from growth medium composition or conditions. Fast. Results are generated on-site in less than one minute. Portable. 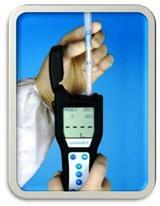 Small hand-held detector, all-in-one sampling device with built-in reagents. Excellent for surface deposit samples.